Typically, you hear reports from our missionaries on this blog. In this post, I thought you might appreciate a glimpse into the life of an African missionary wife. 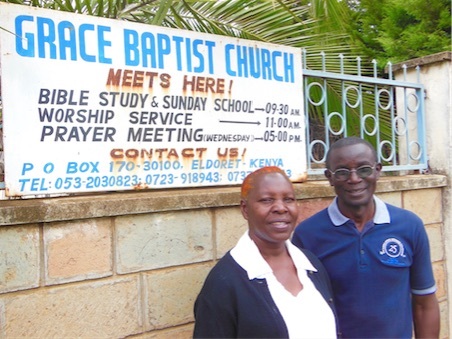 Helida Ogallo is the wife of Naphtally Ogallo, missionary pastor of Grace Baptist Church in Eldoret, Kenya. "My name is Helida Ogallo. The Lord saved me in 1973 in my first year at high school. Salvation was not ‘fashionable’ among my age-mates and so I found myself more often with older believers who were the product of the East African revival which had spread from Rwanda. After high school, I embarked on nursing training and qualified as a Registered Midwife, a calling that I practiced diligently. In 1985, two other things happened alongside my conversion that changed my life completely. The first is that I married Naphtally Ogallo, and secondly, he introduced me to the doctrines of grace. These two, I have grown to love deeply! But more changes were to take place in my life. In 1992 I resigned from medical nursing to be at home and care for our children plus support my husband in the ministry. This action drew lots of criticism from those who felt I had made a wrong decision. I remain convinced that it was the right thing to do. Life hasn’t been easy but the satisfaction is matchless. A strange providence of God was to follow. In 2006 I fell ill, leading my family to relocate from Trinity Baptist Church, Nairobi, to Eldoret where my doctor was. This eventually led to a new church-plant. Following the post-election violence of 2007-08, the church-plant work was greatly disturbed. Over twenty people took refuge in our house for one week. From its inception in 2006 to the end of January 2016, the church has operated from our home, with all the accompanying joys and pains, but the Lord has always given me grace to cope. Often when I speak to college and university students, they marvel at the step I took of resigning from nursing to work at home and to support my husband in the ministry. My answer is that I moved from nursing wounds to nursing souls! There is plenty of God-honoring work for me as a wife in the home and church. The following passage is neglected but remains true: “...the older women likewise...that they admonish the young women to love their husbands, to love their children, to be discreet, chaste, homemakers...that the word of God may not be blasphemed” (Titus 2:2-5)."